You see, the hard-bitten residents of Yangambi like to blow off steam by drinking, hunting, swearing and grabbing local women to sleep with, and Chrysostome is unwilling to join the other officers in these less-than-noble pursuits. The Captain of the garrison, frustrated poet Lalande Biran, accepts the new recruit, if only because of his formidable skill with a rifle. Others, however, particularly Lieutenant Van Thiegel, are less impressed with Chrysostome, waiting only to discover a weakness before planning an attack on the innocent youngster. And why are they there at all? The reality is that it is all about money, exploiting the riches found in the unknown African interior for the amusement of the wealthy of Europe. Lalande and his crew hack down thousands of mahogany trees, destined to be turned into expensive furniture in stately homes. They hunt and slaughter elephants and cheetahs to satisfy the demand for ivory and fur. In this way, the soldiers hope to become rich too – the title of the book refers to the properties Lalande’s wife Christine hopes to attain from her husband’s stay in the Congo. Such wealth comes at a price, however, and it is one most of the soldiers will pay. Marooned far from home, with only a thin veneer of imported pomp separating them from the unknown terrors lurking across the river, few are able to avoid the slide into alcoholism and paranoia, falling prey to disease caught either from the ubiquitous mosquitoes or the women the officers share. Comparisons with Heart of Darkness are, inevitably, unavoidable, and Atxaga’s men (especially Van Thiegel) appear just as crazed as the infamous Kurtz, the central character of Conrad’s tale. I went into this one fully expecting to say yes. I came out of it thinking that it hadn’t lived up to expectations. Don’t get me wrong, it’s a very interesting book, enjoyable in style (although probably not in content), but it just didn’t do it for me. The tone seemed to be caught half-way between a Heart of Darkness-esque tension and a Boys’ Own cheery excitement, and I was never quite sure which was meant to dominate. I was also a little confused by the treatment of Chrysostome, who may or may not have been the centre of the story. For much of the novel, he is an enigma, seen from the outside, and the reader has no real access to his thoughts and history, such as we have for the other characters. Suddenly, towards the end of the novel, the writer tells us all about him – and then lets him go off on his own moody way again… The sudden info dump spoiled the effect of the mysterious outsider, the catalyst for the events which followed, and left me a little disappointed. Yeah, good point about how the topic of colonialism might be received by many readers. I hadn't thought of that. Maybe it's a theme that's run its course? I didn't like this book. I can see it is well written, but the characters were obnoxious. Your comparison with the Holocaust is an interesting one. I do tend to favour novels where we see things from the perspective of the opressed, but a novel from the other side can be even better, if done well. For example, I loved The Kindly Ones. That gave me an insight into how someone can end up executing 1000s of Jews. 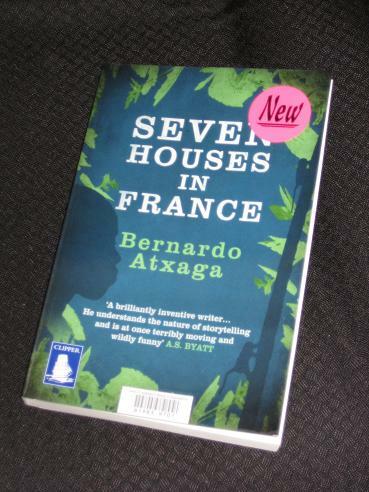 Seven Houses in France didn't give me any insight into the people. I question the point of the novel. In many ways it seemed to be glorifying their behaviour. I agree with your Boy's Own comment – it was that cheery excitement that irritated me. I felt as though it wasn't respectful. On a positive note: it is a good conversation starter! This is the first review I've read of an Atxaga novel and comes just a day after I was perusing my local library's offerings of his work – which did not include this novel, so I'm surprised to see that the subject is Belgium's notoriously brutal colonization of the Congo (I've been eagerly awaiting English translation of David van Reybrouck's “non-fiction novel” Congo, hopefully forthcoming soon). Not sure when or if I'll get around to reading this, but I'm intrigued by almost anything Margaret Jull Costa chooses to translate (did she actually translate this from Basque?). As you know I enjoyed this one although it ended up, not in my top two, which were the first one I read From the mouth of the Whale & the last one Scenes from village life. Lisa – I just think it's a theme many people think shouldn't be touched (possibly a PC thing…). Perhaps I was expecting too much – it certainly didn't do it for me. I'd still like to try another of his though.